We do most of the heavy lifting and provide you with a simple and an intuitive interface that is easy to use while also being the most efficient. From creating the initial schedule and tracking the employee timecards to generating the final payroll, Seamless Timecard offers you a complete Employee Management System with all of the functions just a few clicks away. We offer Windows and Android kiosk devices that you can place on your store and your employees can use it to clock in/out of the shifts, apply for leave, and request timecard corrections. Worried about buddy punching ? (i.e., someone clocking in for somebody else). You don't have to! 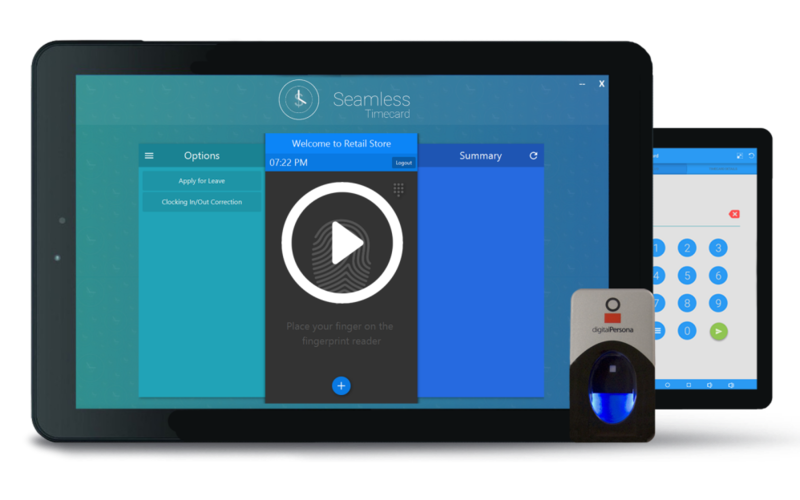 Seamless Timecard is integrated with the state of the art Fingerprint Recognition System to eliminate Buddy Punching and to increase productivity. All your data is synced in real time and can be accessed from the dashboard anytime from anywhere. Your online dashboard allows you to create schedules, manage timecards, and even run payroll whenever you need as long as you have access to the internet. Even when the kiosk is not connected to the internet, the data is stored on the kiosk and as soon as the internet comes back up, the stored data is uploaded to the server and synced to your dashboard. Your data remains safe and sound at all times. Creating schedules for the employees is tiresome. Right? Not anymore! Using our Schedule Cloner, you can now copy any old week's schedule into the current week with just a click and make changes only when needed.